Tony Parker scored a season-high 23 points off the bench as the San Antonio reserves were the difference in a taut 100-98 Spurs' victory over the Memphis Grizzlies on Monday at the AT&T Center in San Antonio, Texas. San Antonio got 67 points from its bench, including 17 from Davis Bertans and 15 points from Danny Green. The Spurs ended a two-game losing streak but won for just the second time in eight games. Kyle Anderson, with 11 points, was the only Spurs starter in double figures. LaMarcus Aldridge returned to the lineup for San Antonio after missing a game and a half with a sprained right ankle and was largely ineffective, scoring seven points and grabbing eight rebounds in more than 31 minutes of court time. Marc Gasol, originally listed as out in the pregame injury report, led the Grizzlies with 23 points and took 10 rebounds. Memphis, who owns the NBA's worst record, has lost 14 games in a row and 12 straight contests on the road, dating back to December. 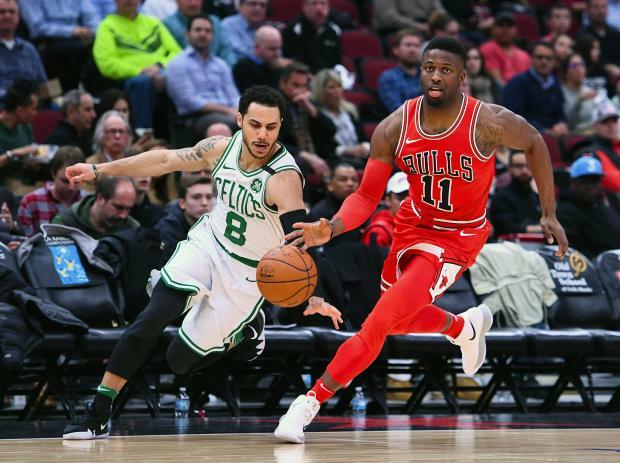 Jaylen Brown scored 21 points, and Boston thrived despite the absence of Kyrie Irving to notch a victory over host Chicago. LeBron James racked up 31 points, seven rebounds and seven assists in three quarters, and Cleveland pounded struggling Detroit in Cleveland. Bojan Bogdanovic matched a season high with 29 points to help Indiana hang on for a victory against Milwaukee in Indianapolis. Damian Lillard scored 19 of his 39 points in the fourth quarter as visiting Portland came from behind to defeat Los Angeles. Lillard knocked down four straight 3-point shots, as the Trail Blazers rallied from an 11-point deficit in the final 5:26 to win their seventh game in a row. CJ McCollum added 22 points and Jusuf Nurkic collected 16 points and 16 rebounds, as Portland beat the Lakers for the 15th consecutive time dating to March 2014. Julius Randle had 21 points and nine rebounds and Isaiah Thomas chipped in 19 points despite a 5-for-21 shooting performance for the Lakers, who saw the end to a five-game win streak. Hassan Whiteside scored 24 points, grabbed 14 rebounds and blocked three shots as host Miami defeated Phoenix. Suns star guard Devin Booker scored a game-high 31 points. It was his eighth straight game scoring at least 20 points. It was also his 21st game this season scoring at least 30 points. Point guard Goran Dragic, a former Suns star, scored 17 points as Miami tied the Milwaukee Bucks for seventh place in the Eastern Conference. Miami has the tiebreaker over Milwaukee, having won the season series. Rudy Gobert scored 21 points and collected 17 rebounds for his third straight double-double to help lead Utah past Orlando in Salt Lake City. Donovan Mitchell tallied 19 points, five rebounds and four assists for the Jazz. Joe Ingles added 18 points, eight assists and seven rebounds. Utah won its third straight game. Nikola Vucevic scored 15 points and collected 12 rebounds while Aaron Gordon chipped in 13 points to lead Orlando. The loss snapped a two-game winning streak for the Magic, who shot just 29-of-85 (34.1 percent) from the field.